Wave, aka C's Chico Wave, is a striking, black seven-year-old female, born July 30, 2000. 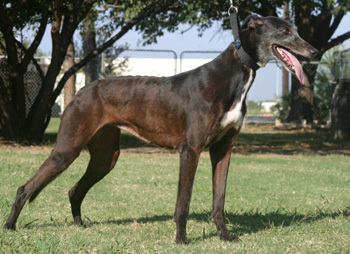 Her sire is Rapido Rambo, making her grand sire Wigwam Wag, and her dam is Cisco Waiver. Ebony is her sibling. Wave has 81 races to her racing credit, starting June 29, 2002 at Tri-State track in West Virginia and ending in Hinsdale, NH on June 9, 2004. 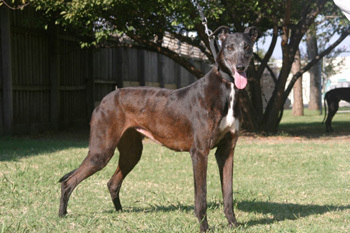 Wave was bred to SKE's Dixiesaint and had 5 registered pups on November 20, 2004. She has been on a brood farm, which went out of business in August 2007, since that time. 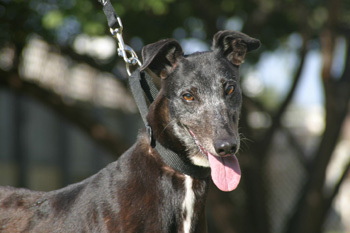 Wave lived briefly in a foster home with an elderly small dog and was very respectful of her. As expected, Wave had no interest in the cats, so she passed her cat test.